Are you looking for an affordable way to dramatically improve the appearance of your property? Look no further than landscape lighting! Lighting up your landscape is a great way to improve the look of your property at nighttime, draw interest to specific areas of your property, and make your property much more impressive. Irreco LLC is a full service landscaping company that specializes in LED landscape lighting and low voltage outdoor lighting systems. Based out of St. Louis, Missouri we provide our landscape lighting services throughout the St. Louis metro. We offer amazing lighting solutions for all areas of your property including lawns, gardens, patios, pools, outdoor cooking areas, decks, statues, monuments, water features, and more. Do you want to drastically improve the appearance of your landscape when the sun goes down? 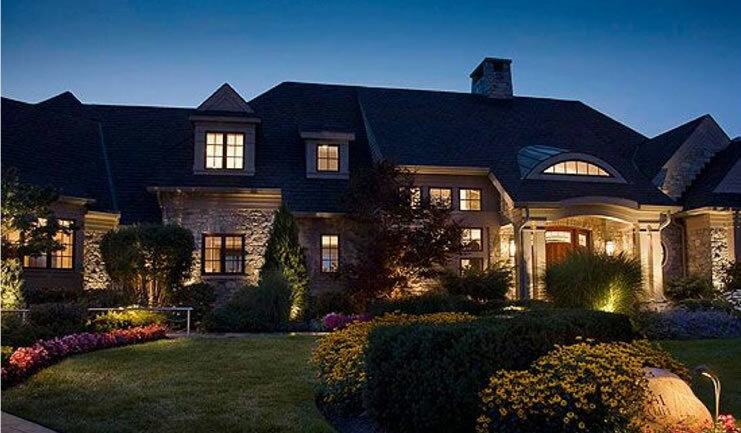 Our team can design and install a custom lighting system that will draw attention to the right areas of your landscape and architecture with beautiful, automated, illumination. There are many benefits to choosing and LED landscape lighting system over an older halogen lighting system. For most homeowners the efficiency and reduced power consumption are the most important benefits, but there are more! LED landscape lights use approximately 80% LESS electricity than standard outdoor halogen bulbs. If you’re landscape lighting is on all night long for the majority of the year this could represent significant savings for you. LED landscape lights last up to 10 TIMES longer than a standard outdoor halogen bulb. No more replacing expensive bulbs every year. LED lights do not emit UV light. This can help reduce the amount of insects fluttering around your property when the sun goes down. This is important for those who like to entertain, host parties and events, or just spend a lot of time outdoors on the patio or poolside. LEDs are widely considered a very earth-friendly landscape lighting choice because they are free of toxic elements such as mercury and they don’t require special disposal methods. LEDs are available in many different colors and can be controlled remotely using your smartphone or controllers inside of your home. There are LED landscape lights that can be retro-fitted to replace almost any type of existing landscape lighting fixture. If you have an older halogen based landscape lighting system and you want to retrofit or replace it with something more modern then an LED system is your best choice. Why Choose Irreco LLC For Landscaping Light Installations? We understand that you have many lightling companies to choose from in the St. Louis area. Installing an LED lighting system isn’t rocket science but there are certain things we do that make our installations better than the rest. We only use high quality LED lighting systems and components, we take the time to make sure wiring is underground and hidden from sight, and we put a great deal of thought into our your system is setup and configured. We just want you to know that when you choose to work with Irreco for your LED landscape lighting you are partnering with a small, locally owned business that has many years of experience keeping St. Louis properties looking their best. You can expect knowledgeable, reliable outdoor lighting services from a company that cares about your properties appearance and our local reputation. If you’d like to get an estimate to install, replace, or retro-fit your landscape lighting then please give us a call 314-246-0099 or fill out our online contact form and we’ll get back to you right away (usually the same day).